This emulator began in 2002, as a personal project I started with the single aim of improving my Flash Actionscript skills. As with any good personal project, you need a focal point, and mine was the Speak N Spell. I'd just bought one off Ebay, to go with the rest of my retro toys, and more importantly, I stumbled across a full set of sound files 'blown' or sampled from a Speak N Spell. I thought it'd be cool to create an emulator using the sound files, and since I'd been working with Flash for a while, including being part of the beta test teams, it seemed like a good mix of idea and execution to improve my knowledge of Flash. At the same time, I was on a Freehand (R.I.P.) beta too, so all the artwork was done using a pre-release version of Freehand (note the bevelling around the red plastic? My first use of filters in Freehand). Again, having a focus and goal makes it easier to set about with your software tools. Unfortunately, my real Speak N Spell didn't work, so I didn't know the correct series of events or how the machine worked exactly, so I improvised, hence only one 'mode' working. I also won't be fixing anything or improving the Speak N Spell, as my time with Flash has passed. I do have a full Speak N Maths drawn up and originally planned to do that too... but no, I'm leaving this page online so people can still enjoy Speak N Spell. House of Ninja – Be a ninja with just your t-shirt! A big "thank you" to everyone who has emailed in to say how much they've enjoyed my Speak N Spell emulator. All the graphics and programming by . 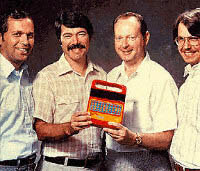 Speak & Spell is a registered trademark of Texas Instruments.